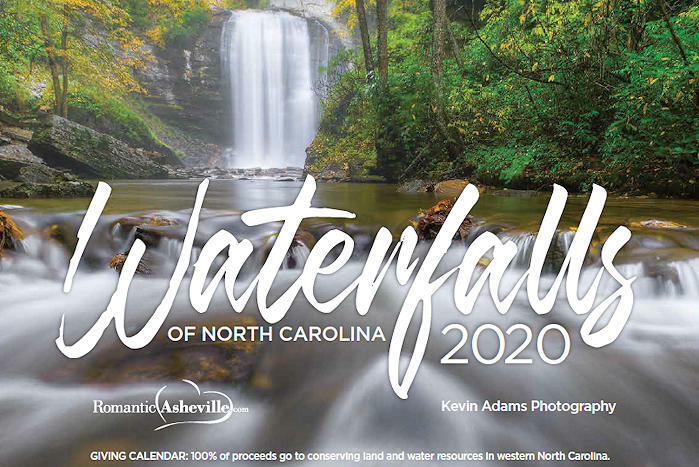 If you love to find waterfalls in western North Carolina, the Asheville area is the place for you! While there are hundreds of cascades in the "Land of the Waterfalls," these are our 60+ favorite waterfalls (each with full page guides, photos and videos) in our Blue Ridge Mountains. They are both beautiful and easy to find. Most of the waterfalls are not signed (on national park or forest land), so take our directions with you! BE SAFE, do not climb rock faces or dive into the water. And do not wade in water above a waterfall since you could be swept over - see our waterfall and hiking safety tips. To find several in one area, go to our Waterfall Maps & Drives. Enjoy! (3 miles round-trip, moderate) This gorgeous 70-ft. waterfall along the Blue Ridge Parkway (Milepost 339), near Linville Falls, is accessed by a very scenic, loop woodland hiking trail. 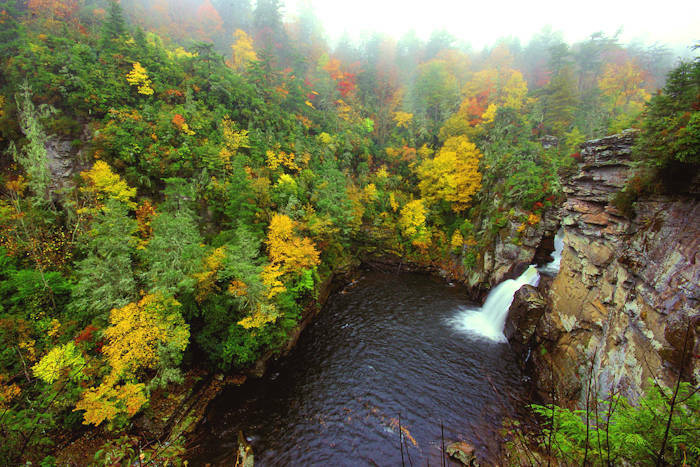 Perhaps the most photographed waterfall in NC, Linville Falls is along the Blue Ridge Parkway (Milepost 316). A moderate hike of 1.6 miles round-trip offers four overlooks, add another 1.5-mile hike for two more vistas. Second parking area in National Forest. Also see Dugger Creek Falls here. This modest waterfall is dwarfed by the towering cliffs above, creating a majestic setting. And it's an easy walk with other waterfalls nearby (French Broad Falls & Mill Shoals). This 80-ft., two-tier waterfall is accessed via an easy hike in Pisgah National Forest (near US Highway 221) north of Marion. It's a great hike for families. One of the few waterfalls with an accessible trail and observation deck for those with walking challenges. See three waterfalls with one stop on NC Highway 215 near Rosman / Brevard, about 7.5 miles north of Highway 64. See this twin waterfall, then walk a short distance riverside to see more cascades and a majestic cliff by Cathedral Falls. All of this is right off the road, but most visitors miss it since there are no signs. (1.5 miles round-trip, strenuous) Also known as Cullowhee Falls, this 150-ft. waterfall at Lake Glenville near Cashiers becomes the most powerful a few days of the year when extra water is released from the dam for kayakers. A new hiking trail takes you to the base for a great view. (2.5-mile round-trip hike, moderate) This waterfall in Panthertown Valley in Nantahala National Forest is small, but really big on beauty with a great pool for a splash. Extend your hike to a 5-mile loop for mountaintop views and another waterfall. Popular camping area. This beauty in the South Mountains State Park near Morganton is a spectacular hike with numerous cascades and wildflowers. The 2.7-mile loop hike also takes you above the falls and back to a picnic area, mountain bike trails, camping and more hikes. This skinny, 200-ft. waterfall is located near Cherokee and the Great Smoky Mountains National Park. It's a short hike up a long staircase. This popular hiking area on the Blue Ridge Parkway has two waterfalls. Second Falls (in pic) is just 1/3-mile walk from the Parkway. Upper Falls is on a four-mile loop trail in the mile-high meadow. Located on the Waterfall Byway, stop to walk behind this roadside cascade. It's located near Highlands. Just a mile away, walk behind a much bigger Dry Falls, along US Highway 64. (1 mile roundtrip) Walk behind this 70-foot waterfall deep in Pisgah National Forest north of Asheville, at the end of a scenic drive with numerous cascades, including Walker Falls. This Backcountry Area of Nantahala National Forest is home to many waterfalls. In addition to the popular Schoolhouse Falls, find hikes to Greenland Creek Falls (pic), Wilderness Falls and Frolictown Falls. This 90-ft. waterfall is privately-owned by a garden club and requires a small admission fee. Located between Saluda and Tryon, it's a must if you are driving on I-26 to/from South Carolina. Ten miles away is the roadside Shunkawauken Falls. (1.5 miles roundtrip, easy) This 404-foot waterfall at Chimney Rock Park is one of the highest waterfalls east of the Mississippi River. The trail takes you to a platform at the bottom of the cascade featured in the movie, The Last of the Mohicans. Especially impressive after a good rain. Roadside 40-ft. waterfall en route to Douglas Falls in Pisgah National Forest, north of Asheville, along a scenic woodlands drive. (1 mile round-trip, easy) Hike to two waterfalls, Upper and Lower Dill Falls, via easy walks from the end of a forest service road deep in Nantahala National Forest. 4.6 miles from the Blue Ridge Parkway. This modest 25-foot waterfall in Pisgah National Forest is a short walk from the road, located 1.8 miles from the Blue Ridge Parkway on NC 215, between Wildcat Falls and Sunburst Falls. This popular swimming hole is on the Cullasaja River along US Highway 64 between Highlands and Franklin. It's roadside, so it's easy for all to enjoy the natural slide and pool for swimming. Located a few miles from the Blue Ridge Parkway (exit at Milepost 344) on NC Highway 80, a 1/2-mile hike takes you to this 75-ft. waterfall. Nearby is Roaring Fork Falls. This 150-ft. waterfall cascades down a mountainside beside the road, so you enjoy it from your car as you drive by! It's located near Columbus, about 10 miles from Pearson's Falls. (1 mile round-trip, easy) Located near Looking Glass Falls, this 25-ft. waterfall is often missed since it's off the beaten path in Pisgah National Forest. This roadside waterfall can be viewed from the top on a walkway along US Highway 64 at Lake Toxaway, located between Brevard and Cashiers. This 20-foot waterfall is along one of our favorite hikes up to the summit of John Rock. To reach the falls, hike about mile from the Fish Hatchery and Pisgah Center for Wildlife Education. See multiple cascades at the roadside Waterfalls Park in Newland, complete with picnic tables. Three falls total about 50 ft., with a short trail to get a closer look at the different tiers. This cascade near Cove Creek Falls flows across an overhanging cliff in Pisgah National Forest. It's a short walk from the road. You can walk behind it when water is not too high. Located near the Pisgah Center for Wildlife Education. This hidden waterfall flows beneath an historic stone arched bridge on NC Highway 215 over the West Fork of the Pigeon River, about four miles from the Blue Ridge Parkway. Also see cascades above the bridge. A beautiful roadside setting. Located near Daniel Ridge Falls is a waterfall on a beautiful two-mile hike that includes a second, smaller cascade. It's also located near the Pisgah Center for Wildlife Education. Located near Moore Cove Falls and Looking Glass Falls, this 150-foot cascade in Pisgah National Forest is also known as Tom's Spring Branch Falls. Accessed by an easy one-mile roundtrip hike. Or hike a four-mile loop. See a beautiful 18-foot cascade near the road in Headwaters State Forest, south of Brevard. It's a one-tenth of a mile trail with a short, steep section. Be careful! See our waterfall and hiking safety tips. For maps and suggested drives, see our Waterfall Maps & Drives.